"The company carries regionally sourced food and household items, including coffee beans, soap, dry goods, and “ugly produce”, in bulk. This eliminates the need for unnecessary waste, helping to divert plastic and packaging from landfills and oceans." "You are sitting at your desk feeling overwhelmed. It is time to recharge the batteries. But what should you do? We have compiled a list of things to do and see. We’ve broken down the ’67 things’ into subsections to suit a variety of interests. Have we covered everything there is to do? No, not a chance. But this guide will offer inspiration to dig into both off-the-beaten-track gems and tried-and-true B.C. highlights. We hope this helps you recharge!" "June is here and so is summer! The month kicks off with Hats Off Day at Burnaby Heights on June 3rd, where tens of thousands of festival goers can enjoy free family fun along 10 car free blocks of Hastings. Miss604 is also pleased to sponsor Vancouver Mini Maker Faire June 10th & 11th, as well as Surrey Doors Open on June 17th, and the Jessie Richardson Theatre Awards on June 26th. Look for all of these events and more." In June top free events include street festivals like Burnaby’s Hats off Day, Car Free Days on Main Street and in the West End, Italian Day on the Drive, and Greek Day on Broadway. Free festivals in June also include West Vancouver Community Day, North Vancouver’s Lynn Valley Days, Aboriginal Day Celebrations, TD Jazz Festival events, the Vancouver Dragon Boat Festival and the list goes on! So many fantastic free things to do!" Surviving Samsara is a multimedia multidisciplinary live theatrical production that incorporates acting, spoken word, Butoh dance, rap, music, film and video. Surviving Samsara recounts the author Kagan Goh’s struggles with manic depression. This story takes place over two decades as Kagan Goh struggles to survive the highs of mania and the lows of depression. As a survivor, Kagan gives us insight into an ‘insider’s’ experience of madness. He exposes the damaging effects of the stigma of mental illness, and explores manic depression not only as a disorder, but as a spiritual emergence — a vehicle for personal growth, healing and transcendence. Kagan’s deeply personal stories illustrate his transformation from victim to survivor to activist. 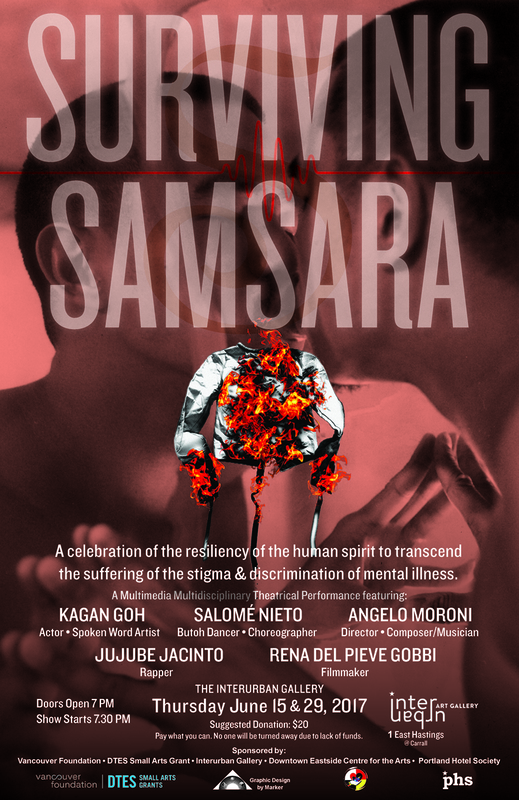 The production of Surviving Samsara is proposed, managed and facilitated by people with personal, lived experience with mental health challenges. KAGAN GOH – Producer, Spoken Word Artist, Playwright, Actor. SALOMÉ NIETO – Butoh Dancer/Choreographer. Renowned for her emotionally-charged performances, audiences have described pataSola co-founder, Salome Nieto, as ethereal, evocative and enchanting. Her work explores the essence of Butoh and the integration of spirituality with her cultural identity. An accomplished dancer and choreographer, Salome has 23 years of specialized Butoh training with internationally-renowned instructors and has danced extensively with Kokoro Dance Company. As well as executing her own works in Vancouver, BC, Salome has performed in Argentina, Mexico, Nicaragua, Thailand, England and Poland. Recent collaborations include projects with Butoh Masters Gustavo Collini-Sartor (Argentina) and Valentin Tzin (Russia), Dianne Farnsworth, Donna Redlick Dance and since 2014 with Poet Kagan Goh (Canada). With more than 15 years practicing Theatre and Music, Angelo has performed in numerous theatre and modern dance companies, including in experimental music ensembles. Furthermore, he has given social theatre workshops to kids, teens, adults, the visually impaired, Amnesty International, and to educators at UBC in Canada and Mexico. In Surviving Samsara, Angelo, the musician/composer, has also given Kagan Goh (actor) directorial support with his written pieces. Jujube Jacinto is a self-taught lyricist, performer, and visual artist living with bipolar. Through her work, she heals personal trauma, inspiring others to do the same. As stage manager in Surviving Samsara, she assists with all technical aspects of the production: successful timing and delivery, costumes, props, projector, and lighting. SURVIVING SAMSARA are available for sale for $20.